TERMINAL 5, a £4.3 billion ($8.5 billion) glass-and-steel palace, stands as a monumental rebuke to the shabby, low-rise buildings that form most of the rest of Heathrow airport. T5’s opening day, March 27th, was marred by the delays and missing baggage for which London’s main gateway is infamous. But travel should become more bearable for customers of British Airways (BA), which has exclusive use of T5. Punctuality is predicted to improve and passing through security should take just a few minutes. In time, T5 is expected to handle 30m passengers a year. The question now is whether Heathrow can grow even more. In the next few months Gordon Brown, Britain’s prime minister, must decide whether to press ahead with the building of a third runway and a sixth terminal at Heathrow by 2020. Expansion looks like the obvious answer to the well publicised problems of an international airport that is both the world’s busiest and the one most loathed by those who use it. Heathrow is beyond full, and a new runway and another new terminal would provide a bit more room. However, obvious answers are not always the best. Additional capacity would be quickly filled. Rival airports, notably in continental Europe, already have the capacity and room to grow that Heathrow will always lack. Higher prices for Heathrow’s capacity, and more competition from other London airports, may be a better answer to the squeeze than making the old airport bigger. Expansion, however, is the demand of BAA, the airport’s owner, and the airlines, especially BA, which holds more than 40% of take-off and landing slots at Heathrow. They will applaud Mr Brown if he gives it his backing. Broader business lobbies will raise a cheer too. Any such plan will be bitterly resisted by well organised residents’ groups, supported by all the main candidates in London’s mayoral election, on May 1st, and by 15 local councils. They contend that the local noise and air pollution caused by Heathrow already amount to an environmental disaster that expansion will only worsen. Moreover, they say, because most arriving planes use a flight path across the capital, a terrible accident is waiting to happen—a claim reinforced by the recent crash of a BA Boeing 777, which only just reached the airport perimeter. The regulatory and financial backdrop to Mr Brown’s decision is if anything more complicated than the politics. The Competition Commission is examining whether BAA’s monopoly in the south-east (it also owns Gatwick and Stansted, London’s other big airports) has contributed to the awfulness of Heathrow. Next month it is expected to reveal its “emerging thinking” about whether BAA should be forced to divest itself of some airports. The commission will have to juggle the merits of greater competition with the airport operator’s financial weakness. Grupo Ferrovial, the Spanish construction firm that bought BAA in 2006, has been caught out by the global credit crunch. Having borrowed about £9 billion to buy BAA, it is trying to restructure that debt and cut its interest bills, so far without success. BAA was afforded only modest comfort by another regulator, the Civil Aviation Authority (CAA), which announced new five-year price caps for Heathrow and Gatwick this month. To help BAA pay for improvements at Heathrow, which include the replacement of Terminals 1 and 2, the CAA will allow it to raise passenger landing charges. Next year they will increase to £12.80. Until 2013 their annual rise will be limited to the increase in the retail-price index plus 7.5 percentage points. The airlines complain that they are being forced to help Ferrovial meet its interest payments. Embattled BAA, which has just replaced its chief executive, replies that it will be investing £5 billion over the next five years and that the money has to come from somewhere. It also says that even if it gets approval for a third runway and sixth terminal, without higher prices it might not be able to pay for them. The aviation industry thinks they might cost £13 billion. What no one seriously disputes is the main reason why Heathrow is so dreadful: it is bursting at the seams. The airport struggles with more than 68m passengers using buildings and systems designed for 45m. Its two runways operate at 99% of capacity. That does not just cap the number of flights at today’s limit of 480,000 a year. With no slack, the tiniest mishap can cause delays to multiply across departure and arrival boards. Even those passengers lucky enough to take off on time (too few: see chart 1) must endure crowded check-in desks, snaking security queues, standing-room only in shopping-mall departure lounges and a long hike to the gate. From T5, BA’s customers should travel more hopefully. But because other terminals are soon to be demolished for the next phase of rebuilding, the airport’s total passenger capacity will not reach the expected 90m for several years. And T5 does not address the chronic shortage of runway space. BAA says that the third runway, which at just 2,200 metres long would be used only by single-aisle aircraft (the existing ones are 4,000 metres), will lift the annual total of flights to 720,000. Meanwhile BAA wants the government to let it use its existing runways more intensively (in “mixed mode”) by 2015, raising capacity, it reckons, by 10-15%. This means ending an agreement on runway alternation, which gives a six-hour break every day to 2m people affected by aircraft noise. In a recent consultation exercise by the Department for Transport (DfT), local opposition to this was even fiercer than to the threat of a new runway. Only too aware of the political difficulties, the government cannot be accused of rushing to expand Heathrow. In 2003 it published a White Paper on air transport. This advocated two new runways in the south-east by 2030, but the government committed itself only to a second runway at Stansted. A 1979 planning agreement prevents the building of a second runway at Gatwick before 2019. The government made clear its preference for a third runway at Heathrow, but feared that this would cause a breach of European Union pollution rules (the area also has lots of road traffic). A proposal for a new airport in the Thames estuary was dismissed as too risky and too unkind to birds. But in a “progress report” on the White Paper in December 2006, the government was much keener on a third Heathrow runway. Two things appear to have changed its mind. One was the growing sense that Heathrow, especially after the imposition of more onerous security measures that summer, was becoming a place that people avoided if they could. The other was heavy lobbying from business, especially BA and BAA, which persuaded the government that Heathrow and its route network were indispensable to London’s economy and that its status as an important hub was already in jeopardy. The economic support for a bigger Heathrow was supplied by Oxford Economic Forecasting (OEF), a consultancy, in a report in October 2006. Paid for by the aviation industry and VisitBritain, a tourism quango, OEF’s analysis also had the backing of the Confederation of British Industry and the DfT. 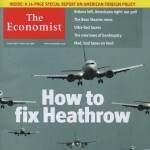 OEF estimated that using Heathrow’s two existing runways in mixed mode would raise GDP by £2.5 billion a year by 2015. A third runway would be worth £7 billion a year by 2030. If all the runway proposals in the White Paper were implemented, the figure would rise to £13 billion a year by 2030. Moreover, without any increase in capacity the costs to airlines and passengers of increasing congestion would reach £20 billion by 2030. By comparison, the annual cost of greenhouse-gas emissions from all the extra flying was put at a mere £700m. That aviation is important to the economy is not in question. But the case for expansion is not quite as strong as OEF’s conclusions suggest. Central to the firm’s estimation of air travel’s contribution to the economy is the value of a business journey compared with a leisure one: £400 for business, £120 for leisure. However, OEF acknowledges that business travel is only about a third of the total from Heathrow. If some leisure travellers were to fly from other airports, capacity would be freed for additional, more valuable business flights. On the assumption that business travellers are less sensitive to price than holiday-makers, one way to bring this about would be to increase the price differential between Heathrow and other London airports. The government also sets great store by the “connectivity” that Heathrow provides as a hub airport. The main reason why Heathrow is so full is the rapid growth in transit and transfer passengers. In 1992, according to the CAA, these made up only 9% of the total; by 2004 they accounted for 35%. International transfer passengers, who never leave the airport, are valuable to airlines (at Heathrow, to BA above all). But they have little wider economic value other than to make some “thin” routes viable and to increase frequencies on the more popular routes. According to work by OEF for IATA, a global aviation-industry body, extra connectivity increases both productivity and GDP. However, in its 2006 report OEF also noted: “Over 80% of companies report that transfers at a continental hub [rather than Heathrow] are either very or sometimes acceptable.” Most people would prefer to travel directly to their destination and should increasingly be able to do so from regional airports thanks to new, smaller types of long-haul aircraft such as Boeing’s 787 and the Airbus 350. But if they must use a hub, they do not much mind whether it is Heathrow, Paris Charles de Gaulle, Frankfurt or Amsterdam. Heathrow’s network has shrunk, from 227 routes in 1990 to 180, but by definition, it is the least attractive routes that have gone: BA has still managed to increase the number of cities it serves in India. Heathrow may lose further connectivity if it does not get a new runway, but it is not clear that a few people wanting to fly from Britain to destinations not directly served by Heathrow would be greatly inconvenienced. Perhaps the chief defect of OEF’s report is that although it puts a price on climate-change emissions, it makes no attempt to do the same for local air pollution or noise, the negative externalities that affect people most directly. Yet whereas greenhouse-gas emissions will be much the same whether or not Heathrow expands (because most of the traffic would go elsewhere), the effects of local air pollution and noise vary greatly depending on where extra capacity is built. The government seems to have satisfied itself that precisely these forms of pollution should no longer hold Heathrow back. When it began a public consultation on adding capacity at Heathrow last November (which ended last month) it surprisingly claimed to have been convinced that all the local environmental obstacles had been removed. It said that new, quieter aircraft would deal with the question of noise. These same planes would also emit smaller quantities of poisonous nitrogen dioxide than today’s fleet. Adding in cleaner cars, the government was confident that EU pollution limits would not be breached after all. That conclusion was based on assumptions suggested by BAA. This month Justine Greening, a shadow Treasury minister and the MP for Putney, under the Heathrow flight path, obtained papers through freedom-of-information laws that show that data from BAA were fed into the government’s environmental models. The Sunday Times, which broke the story, reported that BAA hit the noise targets by raising the number of new aircraft that would replace old ones by 2030 and lowering the number of flights. After a similar approach was applied to cars, it transpired that despite another 240,000 flights there would be no extra pollution after all. It remains to be seen whether BAA’s revised assumptions prove to be correct. According to Sir Peter Hall, the president of the Town and Country Planning Association, Heathrow’s underlying problem is that it has been in the wrong place all along. The 62-year-old airport is hemmed in by residential areas on all sides. To the west, the centres of Slough, Staines and Windsor, all big towns, are within five miles. The proposed third runway is to be shoehorned in between two main roads to London, the A4 and the M4. As aviation has changed out of all recognition, the problems caused by Heathrow’s location have multiplied. Coping with them has become harder, dearer and less popular. Heathrow’s unsuitability as a big commercial airport goes back to its origins as a base for fighters during the second world war. It was built to the west of London, to be less vulnerable to enemy bombers, and was laid out with up to nine runways radiating from a cluster of buildings, including air control, in the centre. A good design for scrambling fighters proved hopeless for a civil airport. Only three runways survived, of which just two (running east to west, and generating most noise blight because of the prevailing westerly wind) proved suitable for regular use. As demand for air travel has risen and risen, governments have attempted to relieve Heathrow by diverting traffic to other airports close to London. Gatwick came first in the late 1950s; Stansted followed in the 1970s. Both are now nearly as full as Heathrow, thanks to low-cost carriers such as easyJet and Ryanair, but in one important respect the policy has not worked. Airlines have had little incentive to move their long-haul routes and the transfer traffic that helps feed them from Heathrow. There is no easy answer to these problems. The government says that it wants to expand Heathrow so it can compete as a hub with rivals on the continent. But for two reasons the expansion of Heathrow now envisaged is almost bound to fail. The first is that Heathrow would be full again within a decade of the opening of a third runway. Air travel is likely to get more expensive because of big increases in the cost of jet fuel and the inclusion from 2012 of airlines in the European emissions-trading scheme. But even so, the CAA’s passenger-traffic forecasts suggest that the growth rate of air travel to, from and within Britain will not fall much below its long-term trend of 5%. Business travel is rising steadily at around 8% a year. At Heathrow, passenger traffic has been flat for two years or so (see chart 2). But this is probably because some transfer passengers, put off by the airport’s squalor and the “one bag” rule imposed by the British government in 2006, switched to less crowded, friendlier hubs. The airlines certainly see no shortage of underlying demand at Heathrow. Charges at Heathrow are not high by international standards (see chart 3), and airlines are prepared to fork out huge sums for slots on the grey market. In preparation for the entry into force of the “open skies” agreement between America and the EU this month, one American carrier, Continental, has just paid over £100m for four slots. The high price of slots strongly suggests that, at today’s landing charges, only lack of capacity is holding back the number of flights and passengers. With T5 and the advent of the Airbus A380 on the busiest long-haul routes, the CAA expects passenger traffic to rise by 15% within five years. It does not forecast the effect of mixed-mode or a new runway, but the chances must be that previously repressed demand would surge to fill the new capacity. The second reason is that the rival hubs on the continent have more capacity now than Heathrow will ever have (see chart 4). Amsterdam has five full-size runways; Charles de Gaulle and Madrid have four, as will Frankfurt by 2010. All are linked to high-speed rail networks by short spurs, something Heathrow can only dream about. Elsewhere, Dubai is fast establishing itself as a global hub linking Asia with the rest of the world. It will soon have six runways. BAA has mused about a fourth runway at Heathrow by the middle of the century. But there is nowhere for it go and it would be too little, too late. In short, Heathrow can never be the competitive global hub the government says it wants it to be. If that is so, what should be done? Almost every other country faced with a similar question has chosen to move its hub airport further away from the capital, to where there is space to expand. The list is long, from Paris to Tokyo. In the early 1970s it was also, briefly, British government policy to build a new airport, east of London, on reclaimed sandbanks in the Thames estuary, to supplement and then supplant Heathrow. The scheme foundered for several reasons: the economic crisis that overtook the country ruled out any big new public investment programmes; there were safety concerns about seabirds being sucked into jet engines; and before high-speed rail the 28-mile distance from central London was deemed too great. At the time of the 2003 White Paper, Bluebase, an architectural firm specialising in large infrastructure projects, made a new proposal for an airport in the estuary. With two big runways and two smaller ones for short-haul aircraft, the airport would handle more than 130m passengers a year, about twice as many as Heathrow can now. Running 24 hours a day and connected to both seaports and the high-speed Channel rail link, its flexibility would have far exceeded Heathrow’s. However, according to Mark Willingale, a senior partner at Bluebase, the DfT showed no interest in carrying out a proper study, even though Bluebase had obtained “spectacular” results from the department’s own model of economic benefits and some initial interest from the Star Alliance (the biggest global airline alliance, which includes Lufthansa, United and Singapore Airlines). Mr Willingale says that the airport could have been built for around £12 billion at 2003 costs (about the same as Hong Kong’s new airport, also built on reclaimed land) and would have complemented plans for a tunnel under the Thames estuary and new flood defences. But it could not overcome the interests ranged against it. He recalls the apparent pleasure of a DfT official producing a report on the impact of the airport on local birdlife: “He pushed it across the table to us with the words, ‘Not good news, gentlemen, I’m afraid’.” Stephen Nelson, the outgoing chief executive of BAA, claims that the government turned down the plan after costing it at £33 billion, an amount well beyond the means of BAA and requiring public subsidy. Mr Nelson puts the cost of the new Heathrow runway at around £7 billion, but it is unclear whether this includes the associated infrastructure and the cost of the sixth terminal. Many planning experts like the idea of an airport in the estuary. The regeneration of the Thames Gateway region (a government priority) can also be called in aid. But the de facto outsourcing of airport-building to BAA, a company that is unlikely to have an interest in doing anything that would reduce the value of its existing assets is, for now, an insuperable difficulty. Roy Griffins, the chairman of London City Airport and a former head of civil aviation at the DfT, argues that one alternative is to accept that, like New York, another world city short of space, London will never have all the airport capacity it could use: “There comes a time when you just have to say, that’s it.” The implication is that rather than relying solely on new capacity, the government needs to find better ways, environmentally and economically, of managing what already exists. A good start would be to recognise that, even at the prices just set by the CAA, Heathrow will still be far too cheap. The CAA is obliged by law to act in the interests of passengers and airlines by restraining BAA from extracting monopoly rents. It must also give BAA an incentive to run its airports efficiently and invest in improved facilities. Striking that balance has proved difficult. Shabby facilities are evidence of under-investment, while, as the CAA privately admits, BAA has been encouraged by charges linked to passenger numbers and the “single till” policy, which allows its profits from retailing to subsidise airside operations, to stuff as many passengers into its airports as it can. The CAA has no duty to promote competition. A different approach would be for prices at Heathrow to rise over time closer to market-clearing levels. This would allow a better balance between supply and demand. The main effect would be to squeeze out the most price-sensitive passengers, almost certainly holiday-makers and those changing planes. The holiday traffic would mainly go to other British airports, such as an expanded Stansted, while the transfer passengers would be more likely to use nearby hubs in Europe. Another effect would be a sharp reduction, perhaps to zero, in the value of slots. The airlines with “grandfather rights” to slots, especially BA, would howl. So would those, such as Continental, which have recently paid a lot for them. Heathrow’s network would shrink a bit more, which would annoy the airlines based there and disgruntle some passengers. But those prepared to pay extra to use the airport—mainly, business travellers—would find it much more pleasant and efficient. That raises the question of whether BAA should be allowed the full benefit of higher prices at Heathrow. A case could be made for the CAA eventually getting out of price regulation if BAA no longer owned Gatwick, the only existing British airport with the potential (given a second runway), to compete with Heathrow. Gatwick is reasonably near London, has good transport links and its main flight path is over the Channel and farmland. It is already the world’s seventh-busiest international airport and the busiest with one runway. With another, it could support more traffic than Heathrow does now. A new owner of Gatwick would have a strong incentive to run it as an alternative hub to Heathrow—something that seemingly has not appealed to BAA. Mr Griffins thinks an expanded Gatwick might well be able to lure a big airline alliance with lower prices and the promise of its own terminal away from the long shadow BA casts at Heathrow. Such is the importance of the economy of London and the south-east—it contributes 40% of GDP—that it could well support a second hub airport. That a bigger Heathrow and a continuation of the flawed regulatory system serve the interests of both BA and BAA is obvious. But it is far less clear why the government still behaves as if it thinks two private-sector companies should be the chief influences on such an important area of public policy. In a saner aviation market, airports would be free to compete against each other and eventually to set their own prices. Over to Mr Brown.